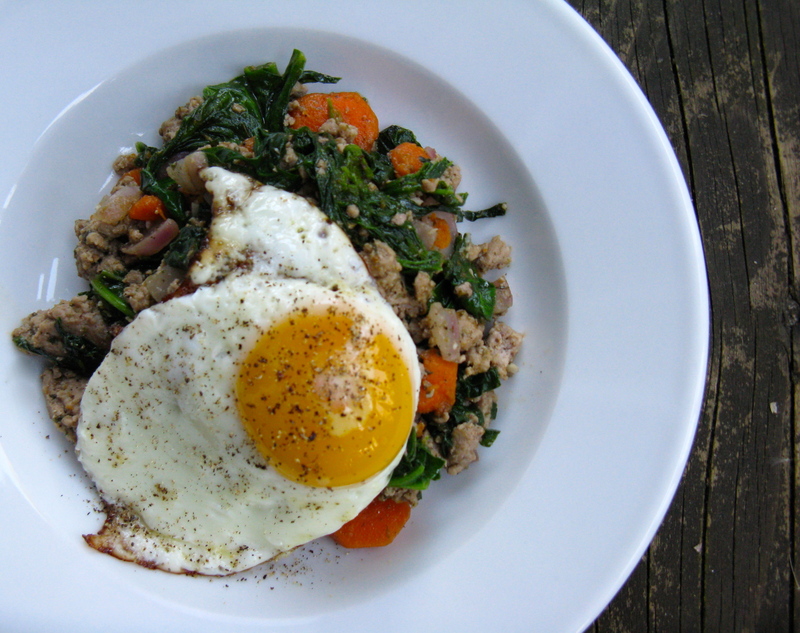 This simple and delicious turkey sausage veggie hash is versatile and pretty much foolproof. I honestly don’t have too much more to say about it, other than the fact that it’s just straight up good. Eat this hash for breakfast, lunch or dinner because it’s delicious anytime! The hash mixture would also be wonderful mixed into scrambled eggs, especially if runny eggs aren’t your thing. 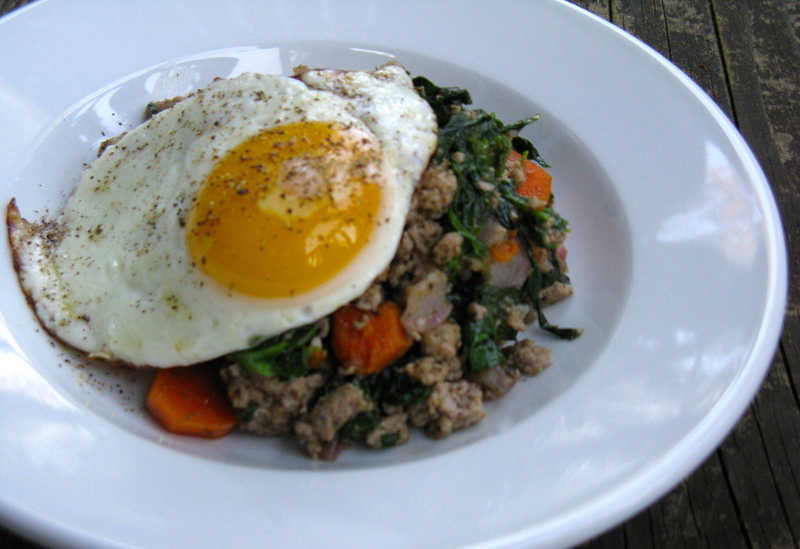 I love runny eggs now, but haven’t always felt that way, so I get it! Melt butter, ghee or coconut oil in a large skillet over medium heat. Add the ground turkey and break up with a spatula. Then, add the chopped garlic. Season with a little sea salt and pepper, and continue to cook. Next, add the radishes, carrots, spices, bone broth, and a bit more sea salt and pepper; stir. Continue to cook over medium-low heat, stirring occasionally, until meat is cooked through and vegetables are crisp-tender. Then, add the torn spinach leaves. Cook another couple minutes, until spinach softens a bit. Adjust seasonings as needed. Optional to serve with a sunny-side up egg on top. I used to ONLY eat hard cooked yolks until a few months ago. Now I can’t get enough! I guess I’m finally becoming an adult. Just found your blog the other day. Love it! Yep, I was the exact same way, Leslie! I’m so glad I came around…it’s a shame to think what I’d been missing (and you too, for that matter!). Thanks for your kind words about my blog! I appreciate it! I did see it and yes, it’s a shame. I purchased this ground turkey over the weekend, before the article came out. Otherwise, I probably would’ve thought twice! I don’t buy ground turkey as much as I used to…I generally stick with ground beef. Does this has freeze well? I’d like to make a batch of it and take out only what I need for individual breakfasts. Thanks. I’ve never tried freezing it, so don’t know firsthand. I feel like it would freeze well though. If you try it, let me know how it goes!